Four middle aged men, held together by their childhood friendship, take a calamitous road trip across the UK to visit their dying friend for one last time. 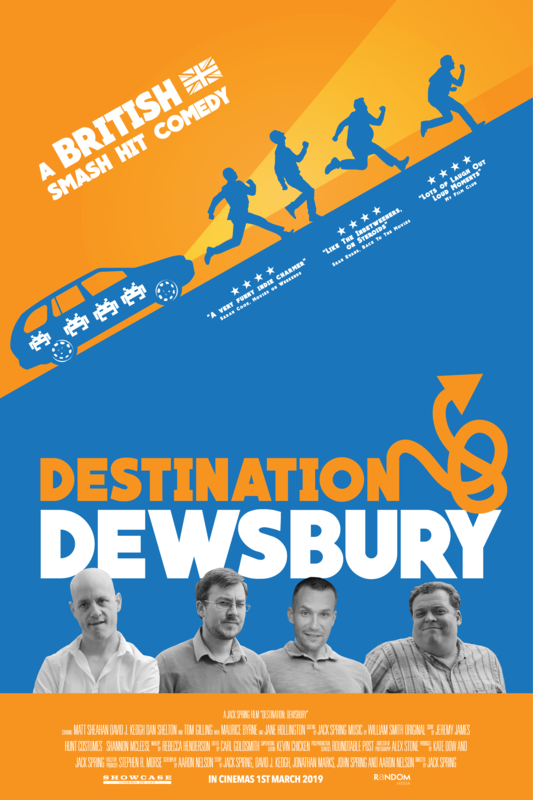 Rude, crude and downright funny, Destination: Dewsbury has been described as 'the smash hit comedy of the year'. Peter, Gaz, Adam and Smithy, all going through their own respective mid-life crises, are brought back together after 20 years when they learn their dear schoolfriend, Frankie, is dying of cancer. Undeterred by their lack of brains, money or even transportation - they embark on a journey across the country to West Yorkshire which sees them entangled in a pensioners' swinging society, overdosing on psychedelic drugs and even falling victim of a kidnapping by Russian gangsters. A laugh-out-loud-funny, warm and charming debut film from Jack Spring that has been touted for big success in 2019. Destination: Dewsbury will take you on a hysterical rollercoaster journey across the dark underbelly of the UK and an even darker side of friendship. For tickets to the UK Premiere of Destination: Dewsbury, please click here.